While the human flea is fortunately, becoming increasingly rare as any cat or dog owner can testify, there are times when our pets make sure that other kinds more than make up for it. Cats and dogs each have their own particular types of fleas – though they are very similar and both will happily infest either animal – and rabbit and hedgehog fleas will sometimes live on cats. All of these will also take a sly bite out of the unsuspecting owner too – though they tend not to stay on board afterwards! Cat fleas are most commonly the ones which cause a problem and solving it is not simply a question of removing them from your cat – or dog – itself. Fleas spend a surprising amount of their time away from their host animal’s body and are very comfortable in warm, carpeted houses. 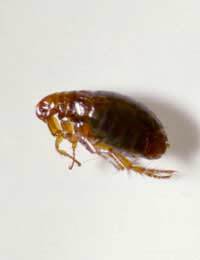 It has been estimated that there are ten times as many of these pests lurking unseen in your home as there are actually on your pet at any one time, so flea control needs a two-pronged attack – based on a little understanding of their lifecycle. Fleas are parasitic, blood-sucking insects, their sideways flattened bodies allowing them to make very swift progress through the fur on your pet’s body. Despite living for only around three weeks, a single female flea lays several hundred eggs and starts within two days of her first feed, so the population builds at an alarming rate from the moment of first arrival. The eggs are laid on the animal, but will drop off into pet bedding or the carpet and modern centrally heated houses provide an ideal environment for the flea larvae which hatch out to thrive and eventually pupate. Spotting a flea problem may not be so obvious as you might suppose, at least in the early stages. The adults move very swiftly through pet hair, so unless the animal is alive with them, they may escape detection, especially in a long coat. Flea eggs are virtually invisible without a magnifying glass, while the larvae are also barely visible to the naked eye and extremely good at hiding deep within the carpet or in the folds of bedding. In addition, although for some pets, fleas can be a serious irritation, not all infested cats and dogs scratch. However, once you begin to notice black sooty particles of flea-dirt at the base of the fur and a few characteristic little red bites on your own ankles, the problem is pretty clear! Breaking the grip of fleas involves treating both the affected animals and the home environment. A variety of products are available to de-flea cats and dogs from both pet shops and veterinary surgeries. Some types come as shampoos, others are sprays while the latest generation of flea control are applied as drops to the animal’s neck. Whatever method is chosen, it must be repeated at the recommended regular intervals to maintain protection against re-infestation while the resident house population is brought under control. A thorough vacuuming is a good start to tackling fleas around the house, making sure to clean everywhere that pets go and then thoroughly disposing of the vacuum contents to avoid them coming straight back. If done very carefully, this can remove most of the adults, but of course a great number of larvae and un-hatched eggs will remain, so step two involves a long-lasting residual insecticide. Again, there are many to choose from; some only work for a few weeks after application and need frequent topping-up while others - obtainable from your vet - offer six months or more of protection. It is obviously important to spray every possible inch of harbouring space to eradicate the flea menace fully – which also includes the car, if your pet ever rides in it. Flea collars can also prove helpful, but it is a good idea to check with your vet if you intend to use one as well as some other form of flea control, as sometimes the two should not be mixed and may be harmful to your pet. Electric heated flea traps can also be useful, the warmth mimicking a pet’s body-heat, drawing fleas from their hiding places in search of a meal – only to find themselves caught on a sticky pad. It is a simple, convenient and poison-free approach which can be used both to help control an existing problem and keep an eye out for one developing. While the very idea of a flea infestation may be unpleasant, the good news is that it is fairly easily treated. As a pet owner you already know where to get the best possible advice – so go see your vet!